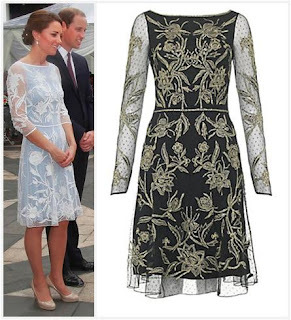 The Duke and Duchess soldiered on in spite of all the...uh...stuff going on, with Kate in a custom version of this Alice Temperley dress. Fancy hair alert: she's upped her updo with added pearl decorations. Jungle chic, I suppose? Anyway, from there it was back in dresses for the flight to the Solomon Islands and more new outfits. Loving the island dress for the evening, which was an official gift and which she decided to wear just a bit before departing. Spontaneity suits her, and the wedges work perfectly. As for the day outfit, I've been waiting for her to wear Jonathan Saunders and I'm not disappointed. It's cute, with a touch of retro, though I must confess it's hard to focus on the outfit when they're traveling in a truck/boat/thingy. That's the way to travel, I'm telling you. We'll pick back up on day 7 later this week.